Treviso is on Bank Place opposite the Mitre. 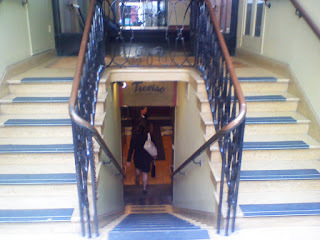 There are a few tables outside, but you head downstairs to the basement for the relatively large main restaurant area. 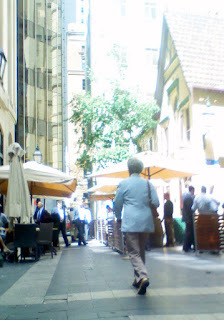 On a Thursday lunchtime it was busy, but we had a reservation so there wasn't a wait. The service was efficient and friendly. I ordered the Spanish pizza, which was a bit small, had a crisp but not brilliant base, with good goat's cheese and chorizo. I felt I'd lost out compared to the lasagne, tortellini and spaghetti dishes others had ordered. It was reasonably pricey given the size of the pizza ($17.90), and I wouldn't rush back if I was paying!